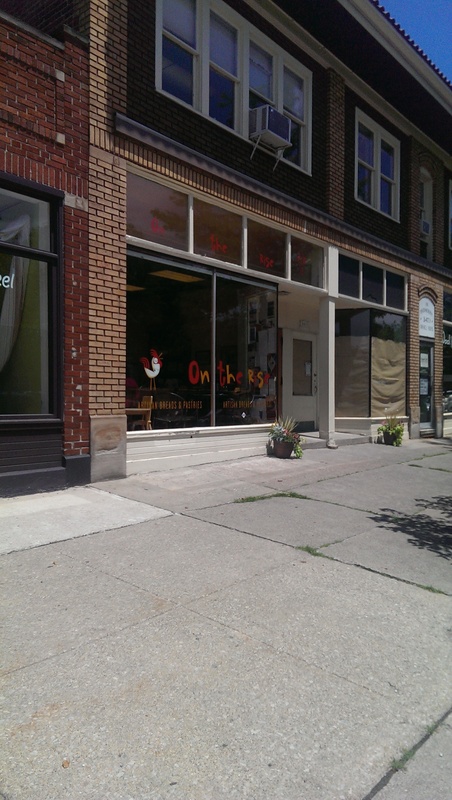 I have been on a quest to find the perfect sandwich in Cleveland. Let me qualify that – the best sandwich on a European-style baguette. Ever since I saw Martha Stewart make a ham sandwich with some kind of aioli on a crusty baguette on her show I’ve been looking for a similar sandwich. I think I may have just found what I have been loo king for. One of the best parts of living in Cleveland Heights for me is all of the excellent bakeries that bake crusty European style loaves that I loved so much in Germany. 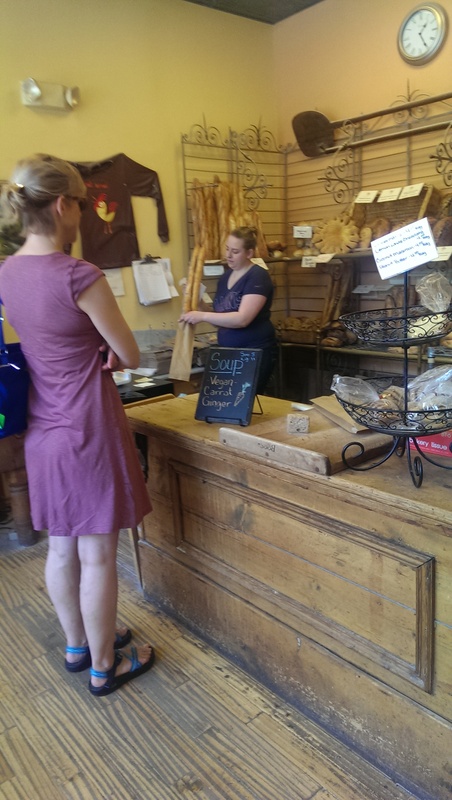 Between Zoss the Swiss Baker, The Stone Oven, On the Rise and Luna Bakery we are pretty darn lucky. 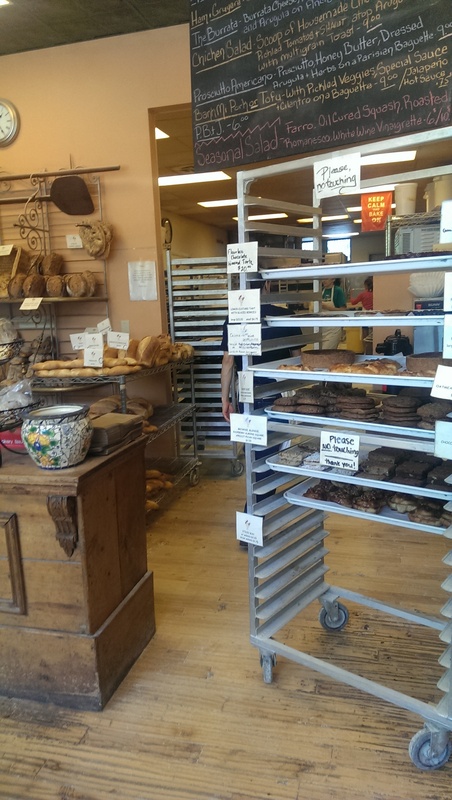 The Cleveland Scene’s most recent survey asked for the best bakery in Cleveland, and Stone Oven, On the Rise and Luna were three of the four choices. It was a really hard choice to make! I love On the Rise. 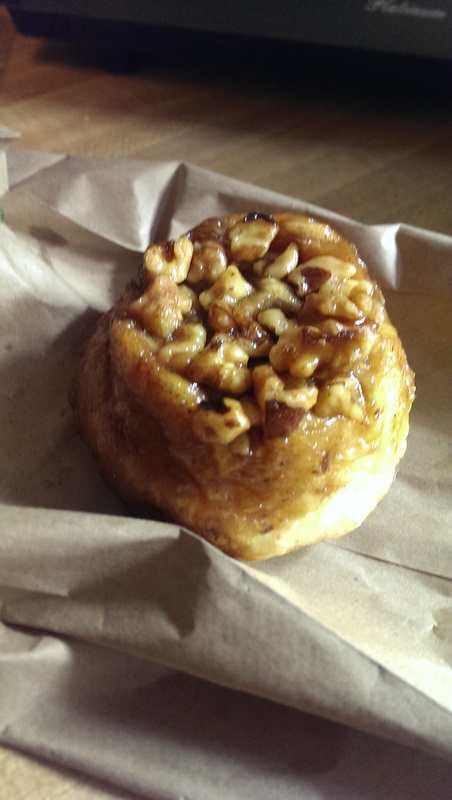 Their sticky buns are amazing, the breads are fresh, and a warm Jennifer cookie (their signature cookie made of oats, nuts, and chocolate) just out of the oven is an orgasmic experience. But now they have started to serve sandwiches and soups on Thursday, Friday and Saturday from 10:30-1:30, and I am done for. I have been wanting t o try their offerings for a while now, and today was my chance. I popped in there this morning to buy some bread for a dinner party I am having tonight. Nothing fancy, just a couple vegetarian friends to share a veggie curry recipe I’ve been wanting to try. I decided to treat myself to two of their sandwiches because I couldn’t decide. I chose the Banh Mi and the Roasted Chicken. I cut them in half when I got home and saved the other halves for tomorrow. They may or may not make it that long. The Roasted Chicken sandwich was like spring on a baguette. A soft yet crusty and delightfully thin baguette. It features roasted chicken, fresh greens, fresh asparagus tossed with pickled onion, herbs and olive oil, an egg salad spread and aioli. It was delightful. Fresh and bright and very flavorful. The flavors melded well together, and the asparagus kept falling out of the sandwich. The asparagus was perfectly crisp and not roasted within an inch of its life. And the egg salad was a great addition to a roasted chicken sandwich. I enjoyed it very much. And then I tried the Banh Mi. Oh, the Banh Mi! 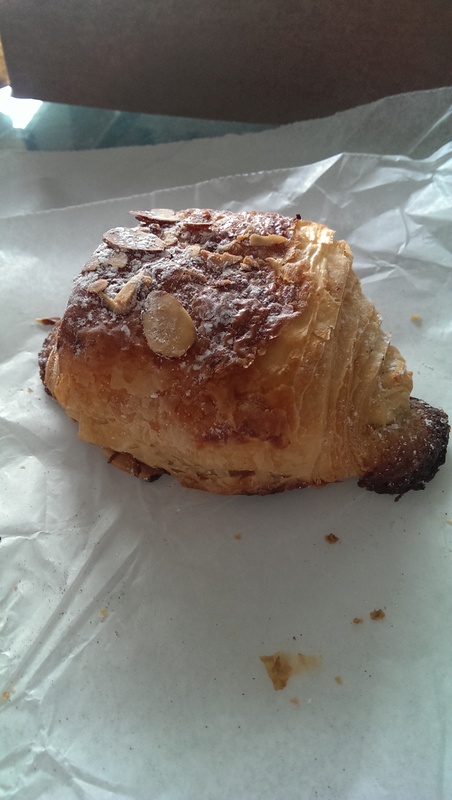 I think I moaned on the first bite. 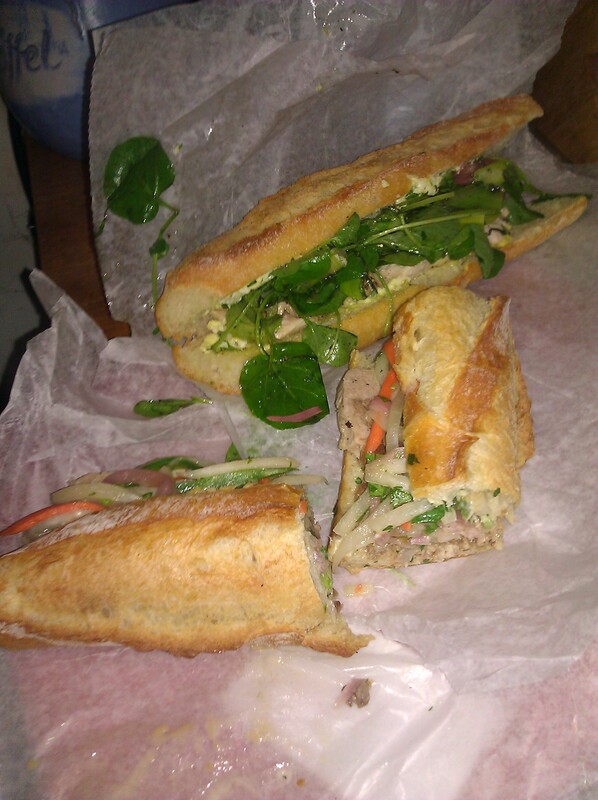 According to their menu, it features New Creation Farm braised pork, Vietnamese pate, jalapeno and cilantro. But it is obviously much more than that. It was flavorful and juicy. I have no idea where the juices came from. The juices dripped down my hand and made the sandwich an absolute delight because it was perfect and not dry. It could give the banh mi from Superior Pho and Saigon Grille a run for their money. The braised pork was yummy and the pate was not overwhelming like the one I had at The Black Pig. The pickled vegetables were crunchy and perfectly seasoned. It made me wish my hands were all thumbs so I could give it ten thumbs up instead of two. If you like a good banh mi, please try it for yourself and let me know what you think. 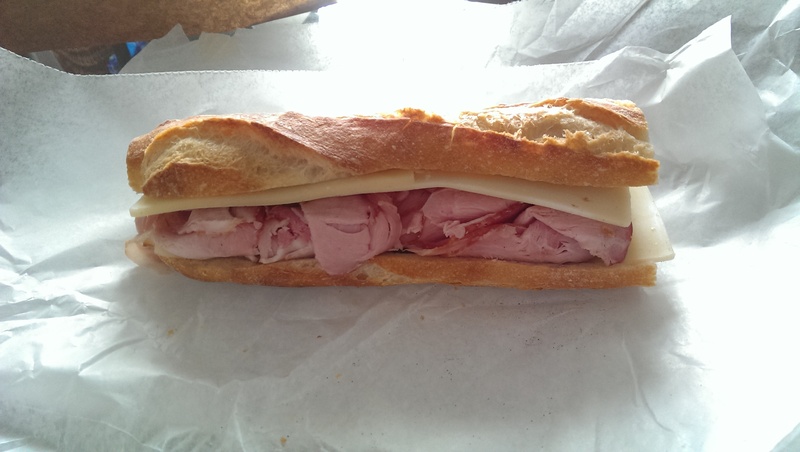 The ham and gruyere baguette is also very good. It features New Creation Farm ham, thinly sliced gruyere and herb butter. I picked one up just after they started serving their lunch menu at 10:30. It made a great European-style breakfast. I sliced some fresh Roma tomato and added that. I loved the bites with and without tomato equally. It was just a solid sandwich. I can’t wait to try their other sandwiches. Vegetarians will be delighted with the Burrata sandwich on one of their rustic rolls – featuring house made burrata from Snowville Creamery cream. The pulled beef baguette with maple slaw and Prosciutto Americano with honey butter and arugula also sound delightful. The menu changes with the season, because all of the sandwiches use fresh, locally sourced ingredients. They particularly thank New Creation Farm, Miller Livestock and Wolff Farm. They also make awesome bread. I buy a loaf of Pullman whenever I’m there. I also love their epi and baguettes. They have special breads all week, including stuffed fougasse and bacon gruyere bread. 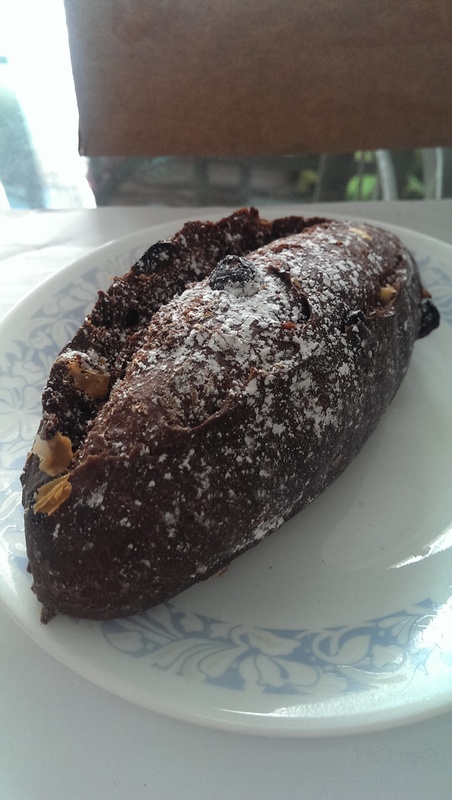 They make a chocolate cherry bread that I love so much I don’t go there on Wednesdays because I will eat the whole loaf.